I am certified to be a personal trainer by WITS (World Instructor Training Schools). My philosophy is How Bad Do You Want It? I do not believe in limits. What you can achieve is totally up to how bad you want it. I will fight right along side you to get you where you want to be and i will be a relentless voice pushing you to where you want to be. I am currently working as a Certified Personal Trainer at the Toms River YMCA. I also work at the Active Healing Center in Colts Neck, NJ as a team member of the 8 Weeks To Wellness. I work with all ages from teens to seniors. 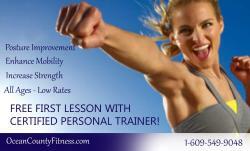 I teach one on one personal training for adults and all around fitness for teens. I was active when i was a young boy but as an adult I became a bit sedentary. I got heavy and my health was at risk. My doctor told me my life and health were in my hands. I did not want to be a statistic. I joined a gym, got a trainer and never looked back. I lost nearly 40 pounds and was so inspired I dedicated my life to helping others become fit and healthy. I soon after became a personal trainer and I see my work as a pay forward. I love helping people!